The Statue of Liberty (French: Statue de la Liberté), officially titled Liberty Enlightening the World (French: la Liberté éclairant le monde), dedicated on October 28, 1886, is a monument commemorating the centennial of the signing of the United States Declaration of Independence, given to the United States by the people of France to represent the friendship between the two countries established during the American Revolution. It represents a woman wearing a stola, a radiant crown and sandals, trampling a broken chain, carrying a torch in her raised right hand and a tabula ansata, where the date of the Declaration of Independence JULY IV MDCCLXXVI is inscribed, in her left arm. Worldwide, the Statue of Liberty is one of the most recognizable icons of the United States. For many years it was one of the first glimpses of the United States for millions of immigrants and visitors after ocean voyages from around the world. 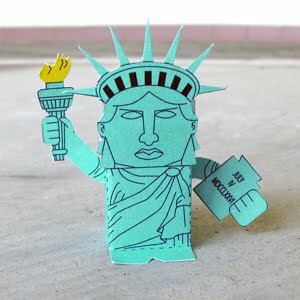 Download the PDF file here and make your own Statue of Liberty toy. Tell us what toys you like to see by visiting our Facebook Fan page.